Low in alcohol content (4% vol. ), Poiré Domfront is best served chilled, at around 10°C. Served in a flute or a tulip glass, the light Poiré Domfront is the perfect accompaniment to every course from aperitif through to dessert. 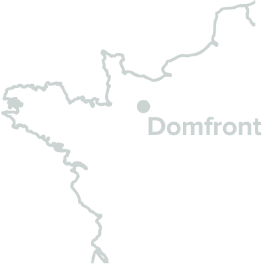 In the Poiré Domfront family there are two distinct profiles to cater for all tastes and occasions. They are lively and complex with a slightly mineral aroma. Served as an aperitif, to accompany fish, seafood and desserts. They are fresh and light with a sweet aroma. Served with veal, cheeses such as the AOP Camembert de Normandie or Livarot, Asiatic and Indian cuisine, and savoury tarts. How to serve Poiré Domfront ? A flute, with its elegant silhouette, is ideal to use for an aperitif with friends, as well as for big celebrations. The martini-style “coupe” is not ideally suited to sparkling drinks as its wide shape allows the aromas to dissipate. A tulip-shaped wine glass is a better choice as it concentrates the nuances of the aroma. At what temperature should Poiré Domfront be served? warmer and it loses some of its distinctive character, its vitality and freshness. Using Poiré Domfront as an ingredient, a sacrilege? It’s a surprising plus! It can partner fish stock, sauces and gravies, and is also at home with creamy bases or shallots. To end a meal with a light finish, why not use it to poach fresh fruit?